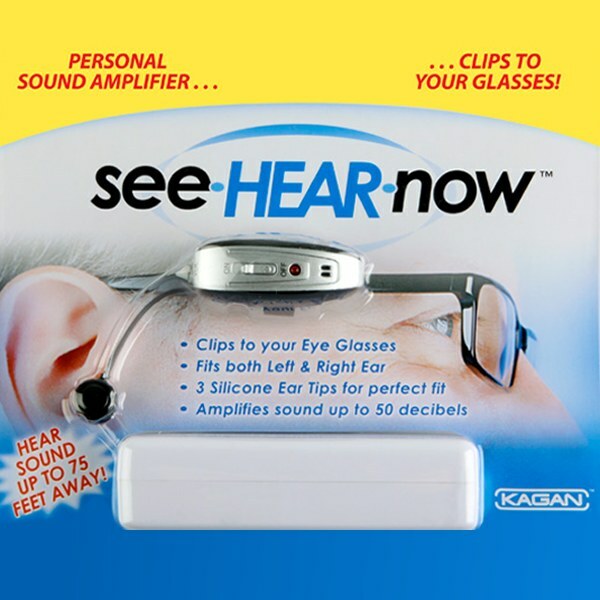 Kagan See Hear Now Personal Sound Amplifier is the perfect way to see and hear! The See Hear Now, a unique patent-pending device, is the solution for those who want to hear more without a bulky device getting in the way of their glasses. like nothing else on the market, the see*hear*now clips inconspicuously to the arm of any style glasses; whether you wear thin wire or thick designer frames. The clip rotates 360 degrees and has a flexible speaker wire that accommodates either ear. The see*hear*now amplifies sound up to 50 decibels, includes a carrying case and four G13-A button cell batteries. Hear sound up to 75 feet away. Whether you&apos;re in the theatre, watching tv, listening to soft music or just having a quiet conversation, you won&apos;t miss any sights or sounds with see*hear*now! The See Hear Now maximizes the natural ability to hear sound.